Hey everyone! Thanks for joining me today, for the May Papertrey Ink Senior DT challenge. This time around we are bringing back Out to Sea! It's been fun pulling out this stylish sets. 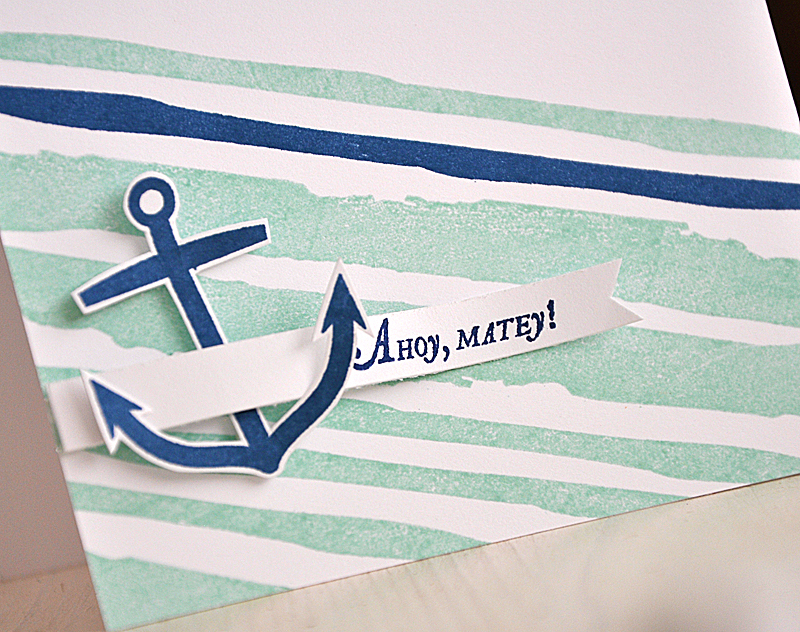 Nautical icons are all the rage. 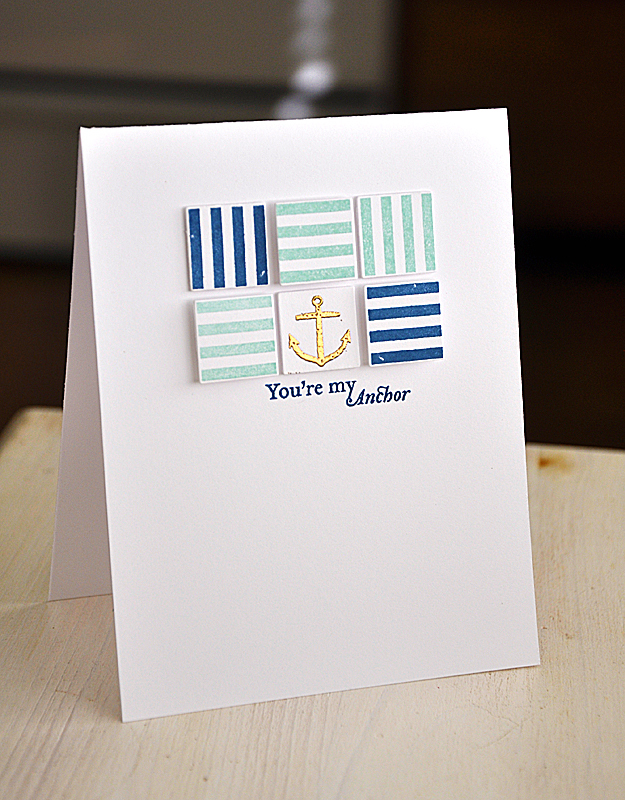 Anchors, strips and yachts can be found on just about anything these days. The previously released Out to Sea designs have stood the test of time and could easily be used to create trendy yet classic projects that fit in with today's trends. In my mind stripes of almost any kind make the perfect compliment to this set. Up first I've opted for a different take on the classic strip. So, I have whipped out Watercolor Wonder for some fun slanted and varying stripes. I hand cut the largest anchor and wrapped it with a tiny sentiment tag. 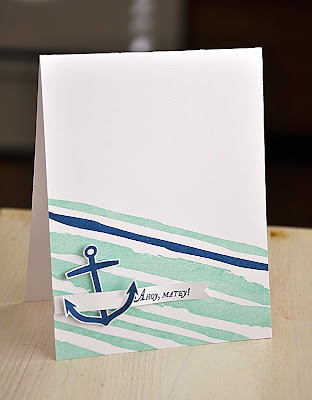 Just A Note: It's a little hard to see in the photo, but I slightly bent the banner so that it tucked and overlapped over the anchor, giving the look of movement to this card. 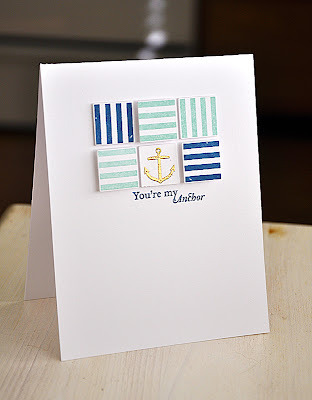 My second pairing is with the striped square image from Square Prints. Stamped it in aqua mist and enchanted evening. Another nautical theme must... gold. 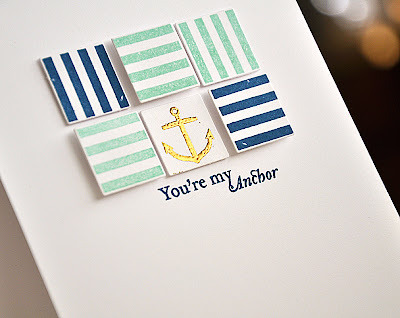 On one of the die cut Square Prints squares I embossed the smallest anchor image in gold. Just A Note: The squares were attached at two different heights, giving this card a bit of movement as well. Then finished the card off with a fitting sentiment. Just amazing Maile! You are so inspiring to me. Oh I love both cards, Maile! Now I have to get out my Watercolor Wonder again--haven't used it like this at all. Thanks for always inspiring!